If fast shifting is what you want for your R50 R52 R53 MINI Cooper or Cooper S, Mini -mize the throw with Craven Speed's adjustable short shift kit. 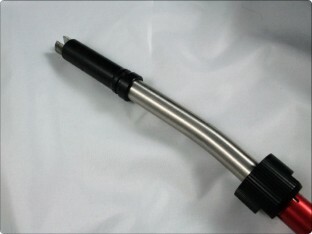 Preferred by track racers as the ultimate "tunable Short Shifter" the advantages of a shorter throw are well documented, but the leverage required by the driver is increased as the throw is shortened. Now you will not have to give that kind of effort during a traffic jam. This adjustable shifter is also great for the MINI owner with a spouse that doesn't like a short shifter. Since it can be adjusted in seconds, you can set it back up to stock position before your spouse drives it, that way they are never the wiser or complain about how hard your MINI is to drive. 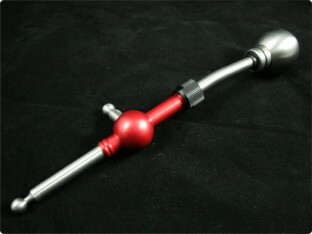 Hybrid designed and CNC machined from Stainless Steel and 6061 Aluminum. The stock knob fits perfectly, but the Craven Speed Short Shifter will also accept aftermarket knobs, including Whalen Shift Machine. Available for MINI 2002-2003 and MINI December 2003 and later. Call for assistance in ordering the correct part for your MINI's build date. Knob and Shift Well sold separately. If you're not sure if you need an '02-'03 shift kit or an '04+, here's how to tell: Carefully pull up the plastic ring (the bezel) that the shifter boot goes into- it's secured to the console by four plastic tabs around the perimeter. Look down in there and on an '02 or '03, much of the plastic linkage will be white but right where the metal shaft and ball enter the linkage, the plastic will be grey. In the '04 models, the housing will be grey and the ball socket will be white. Kit Comes with Craven Adjustable Short shifter, and stock knob adapter. PLEASE NOTE: Photo shows stainless steel shift knob attached to short shifter. Knob is sold separately. Craven short shifter is what Mini should have put in the Coopers from the factory. 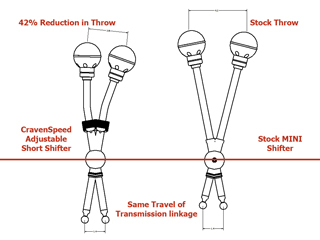 In the shortest position you can shift much faster than ever possible with the stock shifter. In the longest position you still can shift faster than the stock shifter. I highly recommend this shifter and highly recommend Jason and Way!